Molecular biologist Ling Zhao uses Western blotting to analyze toll-like receptor (TLR) activation in response to phytonutrients in cells. Intriguing compounds found in familiar fruits, vegetables, and spices help fight harmful inflammation. And, in doing that, these phytochemicals—the resveratrol in red wine or the catechins in green, white, and black teas, for instance—may also reduce our risk of diseases associated with chronic inflammation, including cancer, atherosclerosis, and diabetes. Inflammation is a double-edged sword. When you have a cut or other wound, it can be a strong defense. But chronic, so-called “dysregulated” inflammation can increase disease risk. Researchers readily admit that they don’t fully understand precisely how beneficial phytochemicals counteract inflammation. But studies led by ARS molecular biologist Daniel H. Hwang are yielding new clues to this complex puzzle. His investigations with cells cultured in his laboratory have uncovered probable modes of action used by phytochemicals from red wine, green tea, garlic, curcumin, and cinnamon. Hwang’s team, based at the ARS Western Human Nutrition Research Center in Davis, California, has found that phytochemicals can interfere with the normal flow of chemical signals or messages sent to and from cells. The cells of particular interest to Hwang are those that are involved in unhealthful inflammation. The messages they send are in the form of proteins. The scientists are closely examining proteins known as TLRs (short for “toll-like receptors”) and NODs (an abbreviation for the tongue-twisting “nucleotide binding oligomerization domain containing proteins”). Hwang’s experiments show that certain phytochemicals can interfere with messages that could otherwise travel from NODs and TLRs. If unimpeded, such messages could easily reach and activate so-called “pro-inflammatory genes.” As their name implies, these genes can trigger an inflammatory response. 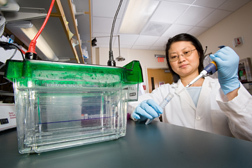 To prepare for a study of the anti-inflammatory effect of phytochemicals, molecular biologist Shurong Huang performs a polymerase chain reaction test. 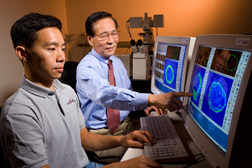 Hwang’s studies indicate that some phytochemicals protect us by disrupting established pathways. When they do that, they block activation of pro-inflammatory genes. The studies suggest that different phytochemicals have different ways of interfering with TLRs or NODs. Take curcumin, for example. Found in turmeric—the main ingredient in curry—curcumin can undermine certain TLRs when a specific part of curcumin’s chemical structure—known as a “beta unsaturated carboxyl group”—reacts with so-called “sulfhydryl groups” in TLRs. But resveratrol, a phytochemical found in red grapes, has a different set of what Hwang refers to as “molecular targets.” His experiments suggest that resveratrol interferes with molecules called “TBK1” and “RIP1.” Normally, these molecules help convey signals to and from TLRs. When resveratrol interacts with TBK1 and RIP1, however, the effect is somewhat like that of a traffic light that slows or stops the flow of vehicles on a very busy street. In other work, Hwang and colleagues have pinpointed likely modes of action of a catechin in green tea, a garlic compound, and a compound from cinnamon. In newer studies, the team is tracing the tactics of other phytochemicals, including those from cruciferous vegetables such as broccoli and cauliflower. The work on TLRs and NODs builds on earlier, pioneering studies in which Hwang probed the interactions between NODs, TLRs, and fats—technically termed “dietary fatty acids”—in food. The researchers were the first to show that modest quantities of good-for-you polyunsaturated fatty acids, especially the omega-3s found in some marine fish, inhibit certain TLRs, whereas saturated fats, like those in red meat and butter, activate some TLRs. The fatty acid experiments provide detailed information about the mechanisms by which omega-3s change the flow of messages from TLRs and NODs and thus help protect us from harmful inflammatiwon. New studies from researchers elsewhere are starting to confirm Hwang’s findings about this healthful effect of polyunsaturated fatty acids. 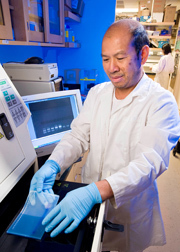 Hwang’s research is documented in Biochemical Pharmacology, Journal of Immunology, Journal of Biological Chemistry, Molecular Pharmacology, and other scientific publications. Many details still need to be discovered about phytochemicals’ helpful role in changing the molecular messaging that goes on inside our bodies. But one message is certainly clear: Chronic inflammation and consequent risk of chronic disease can be altered by what we eat.—By Marcia Wood, Agricultural Research Service Information Staff. Daniel H. Hwang is with the USDA-ARS Western Human Nutrition Research Center, 430 W. Health Sciences Dr., Davis, CA 95616; phone (530) 754-4838, fax (530) 752-5271. "Inflammation and You: How Foods From Plants Protect Us From Disease" was published in the April 2009 issue of Agricultural Research magazine.